Researchers at Turku Centre for Biotechnology have invented new tools for decoding and controlling signalling circuits in living cells with flashes of light. In principle, any cellular circuit can now be targeted with the new method. By using this approach, the researchers discovered that major biological signalling circuits can be made to resonate when driven at their resonant frequency. Resonance is a familiar concept in music, physics and engineering and underlies technical approaches in chemistry, biology and medicine. - Our discovery that signalling circuits of mammalian cells can made to resonate is new and likely to have a relevance in the treatment of diseases. With this method we can control when the signalling pathway is on or off, says Senior Researcher Michael Courtney from Turku Centre for Biotechnology at the University of Turku and Åbo Akademi University, Finland. The team developed optogenetic inhibitors for protein kinases such as JNK which is a central regulator of cell function. - JNK protein in the cell cytoplasm was not thought to regulate gene expression in the nucleus and continuous inhibition in the cytoplasm is ineffective. However, the team found that delivering a specific frequency of inhibition pulses to JNK in the cytoplasm drove inhibition of gene expression in the nucleus. This indicates that cell signalling circuits can be controlled in previously unforeseen ways once the appropriate time-code has been identified, says Courtney. He explains that not only might cell circuit resonance play an unexpected role in degenerative disease processes, but it could even guide the discovery of new therapeutic approaches. Interestingly, the only previous report on cell circuit resonance in the scientific literature showed it can be used to prevent microbial cells from growing. This new discovery of similar behaviour in mammalian cells suggests it could potentially be used to stop cancer cells from growing. - Currently, the development of resistance to new drugs is a major problem in cancer, as it cost billions of dollars to develop and approve new drugs, and yet they can rapidly become ineffective as a treatment. With this new research information, we can perhaps change the frequency instead of using the same drug and in this way achieve a better outcome, says Courtney. The research team's newly discovered phenomenon of circuit resonance in mammalian cells might offer a way to avoid or work around drug resistance. The researchers have now assembled a research consortium which has applied for funding in order to begin the evaluation of this idea. The team started developing light-regulated tools while at the University of Eastern Finland. The project was funded primarily by the Academy of Finland's Photonics programme. The mammalian circuit resonance was discovered and characterised by the team after moving to the University of Turku. The team received support from the Turku BioImaging Screening Unit and funding from the National Cancer Institute in the Uniteds States, the EU-Marie Skłodowska-Curie programme, and Finnish foundations including the Magnus Ehrnrooth, Alfred Koredelin, Instrumentarium and Orion Foundations. This work was published in the Nature Communications journal on 12 May 2017. 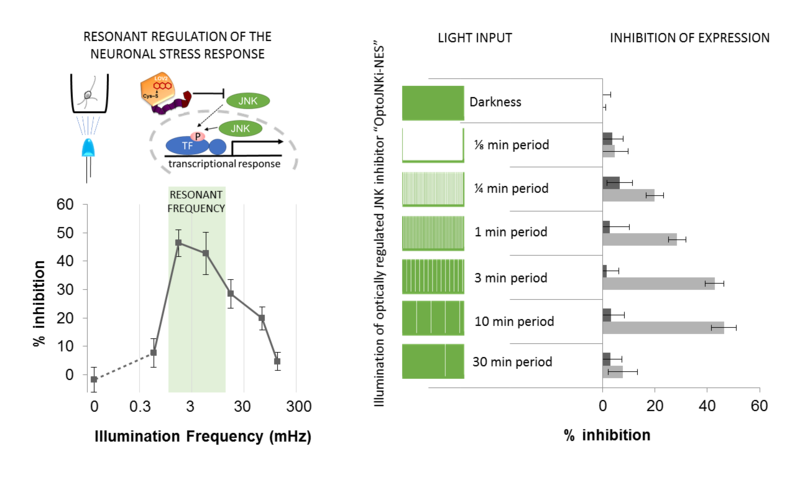 Original publication: Melero-Fernandez de Mera RM1, Li LL1, Popinigis A, Cisek K, Tuittila M, Yadav L, Serva A, Courtney MJ (2017) A simple optogenetic MAPK inhibitor design reveals resonance between transcription-regulating circuitry and temporally-encoded inputs. 1equal contribution. Nat. Commun. 8, 15017 doi: 10.1038/ncomms15017.